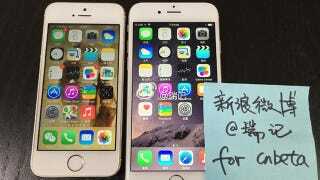 The tech blogging world was alight this morning with purported images and video of a leaked iPhone 6. That's not surprising—in the run-up to Apple's iPhone 6 event on Tuesday, leaks and rumors are inevitable. But as always, it pays to have a skeptical eye. Today's leak, at face value, seems pretty convincing: The leaker provides a whole host of images of a mystery device that sure looks like an iPhone. It's got the same 4.7-inch dimensions and overall aesthetic that we've been teased with for months. There's even a brief (mirror-image) video showing the alleged leaker unlocking the alleged iPhone 6 using the alleged fingerprint scanner. Looks pretty legit, at least in comparison to alleged Apple leaks of the past. But it always pays to be skeptical. Fake iPhone models are not hard to make. Witness the way TMZ got bamboozled by an iPhone 6-esque mystery device. "Drool, geeks," the headline compelled—while the photos showed a handset that was most likely some kind of cobbled-together Android freak machine wrapped in knockoff Jony Ive clothes. Today's mystery "iPhone 6" could very well be another example of such trickery. Sure, many sites pointed to the smooth, glitch-free way the purported iPhone went from lockscreen to homescreen in the video clip. Some took the apparent functionality of the phone's fingerprint sensor as strong supporting evidence. But NowhereElse's Steve Hemmerstoffer, himself a highly reliable source of leaked iDevice info, points out that a well-equipped fake-maker could easily rig up a fake TouchID setup on a fake iPhone. Then there's the video itself. If you're going to the trouble of showing video proof that your iPhone 6 is, in fact, an iPhone 6, why not show more of it in action? That unlock sequence looks smooth, but what about showing us some other functions? Lots of folks noticed the apparent credit card icon in the leaked phone's Passbook icon, alleged evidence of Apple's new mobile payment partnerships. Why not show us how it works? Then there's the most perplexing part of the video. As Steve points out, knowing how vehemently Apple hunts down leaks, why would you show your face in a video next to a purloined phone? Leakers know this. Some of them are historically reliable, proven sources of solid information gotten by knowing the right people in the right places. But just remember that for every reliable leak, there's a boat load of sketchball fakes, and whatever you end up seeing this weekend could be one of them. Update: Steve Hemmerstoffer showed up in the comment section below and explained the specific features of this alleged iPhone 6 that make him think it's a fake. Steve writes for NowhereElse, a site that publishes leaks about the iPhone and other devices. On the one hand, that means Steve perhaps isn't entirely impartial. On the other hand, he points out some interesting details on this leak. See his full comment below.